ATX will display a demo of its SimplifIPTV system in Las Vegas at booth SU10110. 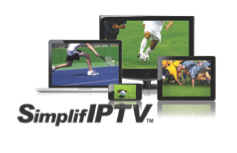 The solution is part of its complete end-to-end IPTV solution for Private Video Networks (PVNs). The system includes IP set-top boxes, PC clients and mobile clients for delivering IP video to large format displays (TVs), Windows PCs, and mobile devices. The SimplifIPTV middleware server manages client authentication and access control, provides client User Interface (UI) customization capability, and supports advanced features such as an interactive program guide and live television playback. ATX’s complete end-to-end IPTV solution also includes UCrypt gateways, DigiVuII encoding, VersAtivePro license-free transcoding, and DigiStream digital signage/content streaming devices. ATX Networks designs, manufactures, markets and delivers a broad range of digital video and IPTV solutions to the global cable television industry, and PVNs (Private Video Networks). Sectors served include healthcare, enterprise, government, broadcast, hospitality, education, stadiums/arenas/casinos, retail, worship, and telcos. ATX’s solutions include gateways, multichannel and PEG encoding, transcoding, digital signage/content streaming solutions, RF management, RF filters, transmitters/receivers, headend and MDU amplifiers, node segmentation, node/amp upgrades, monitor/control equipment, pads/EQs, drop amps, digital voice switches, and connectors.